Dimensions 46 x 23 x 19 The images show a Dark Walnut Finish. All items are made to order. Some assembly required. At DSK Industrial we strive to produce the highest quality custom furniture possible for your home and business. Our unique designs and quality craftsmanship are what separate us from our competition. You can be assured that our furniture will be around for many years to come, because we don't believe in using things like particle board and plastic. Everything we produce utilizes thick slabs of hardwood and steel pipe. We hope that you will consider DSK Industrial as your provider of beautifully handcrafted furniture! Can't find exactly what you're looking for? We understand, the struggle is real. DSK Industrial knows that every space is different, and because they're different, they require specifically dimension-ed furnishings to optimize functionality and cosmetic appearance. We are happy to help! If you know your dimensions, email us for a quote. 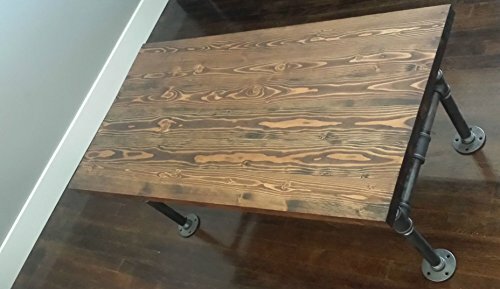 DSK Industrial can create your furniture with any species of wood available to us. We currently use Douglas Fir for all pieces, unless otherwise noted. Every piece of wood differs, but the wood grain is consistent. You may receive a piece with more knots than another we have created, or a live edge, wider wood grain, or even smaller. We have an excellent source for Oak, Maple, Cedar, Cherry, Douglas Fir, Mahogany, Zebrawood, Padauk, Narra, and Leopardwood. *Pricing may vary. All dimensions approximate. We aim to provide quality product and customer service. Please read all shop policies and please contact us with any questions or concerns.